Are you passionate about providing people, particularly children and youth, with access to a diverse range of exceptional programs and services? Are you excited about having the opportunity to actively engage with the community to increase the library’s profile and to develop high-quality, relevant programs that meet our community’s needs? Are you committed to building strong collections for children and youth, and connecting them to relevant, accurate information resources? Are you excited about working in an environment that values flexibility and the willingness to jump in to do what is needed to ensure library users have an exceptional experience? Then the Programs & Community Development Librarian position may be for you. The Cranbrook Public Library is located in the southeast corner of British Columbia, at the foot of the Rocky Mountains, serving the 26,000 residents of the City of Cranbrook and surrounding area. We are committed to working collaboratively to reach out and support the needs and aspirations of everyone we serve by providing access to a diverse range of collections, services and programs 7 days a week. In 2018, our team of 20 full and part-time staff welcomed over 130,000 visitors. the coordination of public events and outreach activities. This position is also responsible for the selection of material for the children’s and youth collections; and the management of all collections to ensure their ongoing relevance and currency. The Programs & Community Development Librarian supports the Information Services Manager in the provision of reference services, especially for children and youth, and exam invigilation services. In addition, the Programs & Community Development Librarian acts as the Deputy Librarian in the Chief Librarian’s absence. The job description provides a full description of responsibilities and required skills. Master’s degree in Library and Information Sciences. 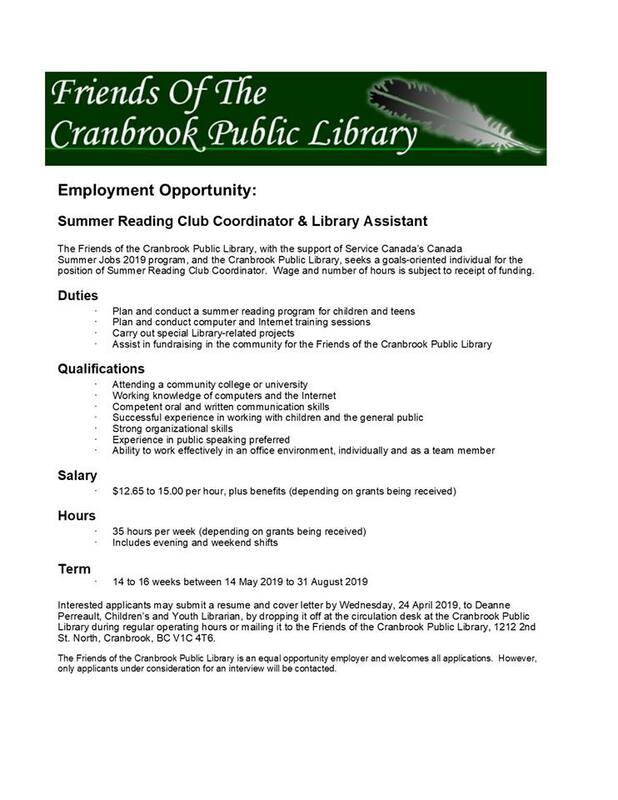 A minimum of 3-years experience of progressively more responsible positions in a public library setting, and at least 1 year in a leadership role. A valid class 5 driver’s license and access to a personal vehicle. Experience planning, delivering and evaluating programs and special events. Experience in collection development and management, specifically for children’s and youth material. Experience in providing reference services, particularly for children and youth. Strong communication and interpersonal skills are essential for success in this position. This position also requires a high degree of confidence and comfort with public speaking and presenting programs. Additional skills include the ability to use independent judgement and initiative; strong organizational, analytical and project management skills; the ability build and manage an effective team, the ability to express a vision for moving the library’s programs and community development goals forward; comfort in using traditional and social media platforms; interest in identifying and integrating current and emerging technology to enhance programs and services. A criminal record check is a condition of employment. By email in PDF format to ubrigl@cranbrookpubliclibrary.ca. The library thanks all those who apply, but only those candidates selected for an interview shall be contacted. Application acceptance extended until April 30, 2019.